March 18 will be the first National Breakfast Day. And to celebrate this event, one of our favorite fast food chains, McDonald’s, will be serving free McMuffins to the first 1,000 visitors for the day for each McDonad’s restaurants. McDonald’s Cebu Branches that will participate in the National Breakfast Day!!! Now there are more reasons to cheer “ Hooray for Today” come morning of March 18, 2013, the day for McDonald’s National Breakfast Day! How to Participate in the National Breakfast Day and get free McMuffins? Every McDonald’s branch in the Philippines that serves breakfast will join this event, including those in Cebu. 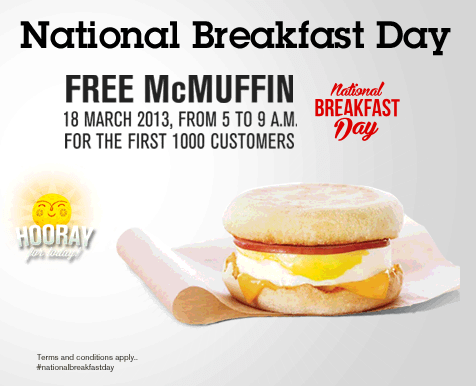 The National Breakfast Day Promo of McDonald’s is set on March 18, 2013 only. The first 1,000 customers for the day will be given free McMuffins. This promo will run from 5 to 9 AM. Here are the terms and conditions if you want to partake on this event and have a free McMuffin. McDonald’s Coupons for the FREE McMuffin will be given to 1,000 customers on a first-come-first-served basis. The coupon must be given to the service crew upon redemption. Redemption does not require any purchase or minimum purchase what so ever. The free coupon is valid only for the said day for dine-in, take-out and drive-thru customers. Coupon/offer is not transferrable to cash and/or other McDonald’s products. McDonald’s reserves the right to refuse redemption if coupon was found to be tampered with. Free product may vary from illustration. McDonald’s reserves the right to replace the free McMuffin at its discretion, without any prior notice to its customers. So get ready to wake up early and go to the nearest McDonald’s restaurant near your place and get a hearty breakfast for free courtesy of McDonald’s. LIKE the We LOVE Cebu Official Facebook Page to be updated on the latest news, travel tips, promos, events and food trips here in the Queen City of the South!! !